Next in the series on Chip's American Jerky is this Spicy Southwest variety. See my previous review of their Mild Midwest. Chip's American Jerky is a brand of Chip's American Jerky Co, LLC, of Pikesville, MD. The company has been around since 2003, but didn't get it's first product on the market until 2008. Chip Forward, the founder of the company, is a retired U.S. Air Force Senior Master Sergeant, who started making jerky in the service back in the 1980s. Thus far, the two varieties he offers under his new company is geographically themed, "Spicy Southwest", "Mild Midwest", which makes me wonder what's in store for Northwest, or New England, etc. Sliced beef round, water, spices, soy sauce powder, dehydrated garlic, dehydrated onion, salt, brown sugar, natural hickory smoke flavor. The first thing I taste from the surface of these pieces is a light smoky flavor, and a light spicy tingle building on my tongue. Several more seconds, I can taste some chile pepper, something like cayenne. I can taste some saltiness through a little bit of sucking. Overall, it's light tasting surface flavor, with a light spicy bite. The chewing flavor starts with a little bit heavier cayenne pepper flavor, some natural meat flavors, and a stronger spicy burn, and a bit stronger saltiness. I can also detect a slight bit of garlic in the background. For being dubbed "Spicy Southwest", there's indeed a spicy burn to this. I'd rate it as "medium hot" on my hot scale, which could be considered "hot" to some others. However, after eating several pieces, that burn builds up to "hot" on my scale. If you're not into hot foods, you'll probably find this very hot. But it seems to vary with some pieces having less burn. The "medium hot" rating I gave is based on the hottest pieces I found. In terms of spicy flavor, it's similar to that of cayenne pepper seasoning. At least, that's the flavor that seems to stand out the most. I do taste some saltiness and some garlic, but I don't necessarily classify that as "spicy". Overall, I think Chip's use of the word "Spicy" refers more to the degree of heat, as opposed to the degree of spices used for seasoning. The natural meat flavors are easily noticed, though not strong. I think the cayenne seasoning is still a bit more dominant. But the meat flavors are not necessarily light either. It's a dominant flavor, but still sits behind the cayenne. It has a "cooked" flavor, similar to that of pot roast. The level of saltiness seems light overall. The burn from the cayenne might make the saltiness seem higher. The garlic flavor I noted above remains light but noticeable over several pieces. There's also black pepper on this jerky, but it's not detectable, perhaps because the cayenne pepper is much stronger. Overall, what you're going to taste in this initially is a light smokiness. Soon you'll taste the cayenne pepper flavor, and experience a strong cayenne pepper burn. You'll notice the natural meat flavors, and a weak garlic flavor. That initial light smokiness is only there in that first piece, after that the stronger cayenne pepper will make it hard to find again. This is a dry jerky that seems to get more dry as I sit here writing this review. It started out being somewhat easy to chew, to where just an hour later it's rather tough. At this point it requires a fair amount of effort to tear a chunk off, and to chew. The chewing texture starts out feeling dry and woody, but it seems to break apart rather easily due to a brittle consistency. It still takes a fair amount of labored chewing, however, before it gets to a soft mass. At that point, it doesn't really feel like steak at all, it's more like dried out pot roast, more crumbly than anything else. There's also quite a bit of stringy sinews in this meat, which leaves behind some small wads of unchewable tissue in my mouth. 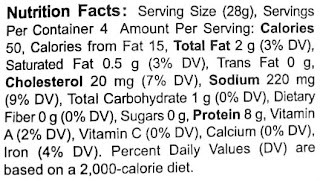 I don't see any chunks of fat on this jerky, and no tendon or gristle. My fingers don't pick up any residue handling these pieces, but tearing a chunk off does cause tiny fragments to fly off on my lap. Chip's American Jerky sells this Spicy Southwest variety from its website at a price of $9.00 for a 4oz package. I bought two packages, each a different variety. Add to that shipping costs of $6.00, and it brings a total of $24.00. That works out to a per ounce price of $3.00. For general jerky snacking purposes, at the $3.00 per ounce price, it's a weak value. I get a good amout of snackability for its good overall flavor, though that gets tempered by the dry tough meat consistency. But $3.00 per ounce is a very high price for jerky, and as such a jerky has to be REALLY good to provide a good snack value. As a Spicy Southwest jerky, at the same $3.00 per ounce price, it's a fair value. 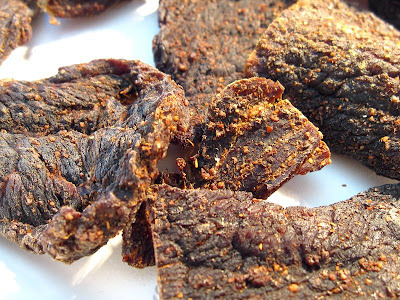 It certainly does pack a lot of spicy burn, which could make this a worthy buy if you want a jerky that packs a good deal of heat. But, you'd have to buy at least a couple pounds of this stuff to water down the shipping costs, and get the price per ounce down. 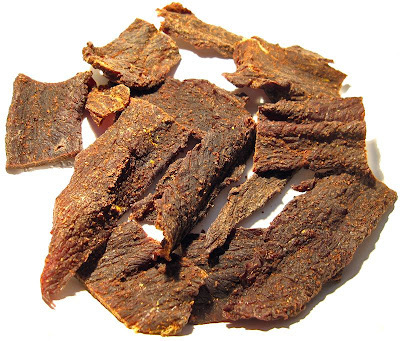 This Spicy Southwest variety from Chip's American Jerky is very much like their Mild Mild Midwest variety, with some natural meat flavors, and a light garlic taste, but with the addition of cayenne pepper. The cayenne adds a fair amount of flavor, but also packs a lot of heat. Depending on your tolerance for hot foods, you could see this as "medium hot" to "very hot". 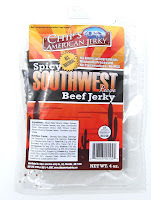 But unlike the Mild Midwest variety, the meat consistency in this Spicy Southwest jerky much more dry, and more tough. That may be due to variances from one batch of jerky to another, as opposed to being a characteristic of this particular flavor. I think the flavor of this Spicy Southwest is good enough to earn a "good" rating, instead of the "average" rating I gave it. The addition of the cayenne pepper gives it enough extra flavor interest beyond the Mild Midwest I reviewed previously. It's just the tough eating, and crumbly chewing texture that kept me from assigning that higher rating. For my recommended beer pairing, try a brown ale.